Silk Bingo has been around since 2009 and has gone through many changes over the years. The site was originally part of the Dragonfish network, but made the switch to United Bingo in January 2013. The Silk Bingo homepage looks great with a stylish red and gold colour scheme and even the bingo ball logo draped in silk screams quality. You can really tell they have made an effort and gone out to design a site that will appeal to both male and female players alike, and they have definitely succeeded. 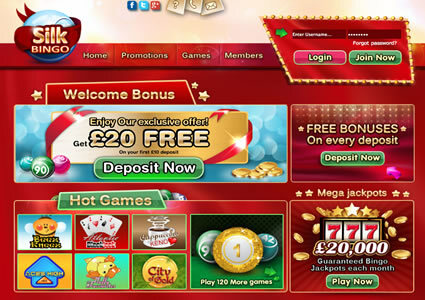 The rest of the Silk Bingo homepage is equally attractive with a selection of nice banners advertising their latest promotion and a few of their most popular games. At the top of the page you will find just four buttons; Home, Promotions, Games and Members, and these make navigating your way around extremely easily with the minimal number of mouse clicks. Just above these you will find three links to their social networking sites and it’s always a good idea to give them a follow, as these are the easiest way to keep up to date with everything they have going on. Click on the green ‘Join Now’ button and you will be taken to the registration page. You will need to enter your basic information such as your name and address, and come up with a username and email address, but you will not need to enter any credit card details until you decide to make a deposit. If you opt to credit your account though, there are plenty of different depositing options and you will be welcomed with a higher then average first deposit bonus followed by re-deposit bonuses on every subsequent deposit. Head into the lobby and you will find just six tabs, leading to the different games on offer. Silk Bingo is home to 75 ball bingo, 90 ball bingo, slots, instant games and casino games. Click on any of these tabs and it will bring up details of the different rooms available, but they are not all open 24/7. From the lobby you can see the time until the next games starts, the ticket price, the number of players taking part and the jackpot up for grabs, so you can easily see where the best place is to try your luck. All of the Silk Bingo rooms use the software’s standard layout, so if you ever played at any other sites using the Globalcom/888 software, you will feel right at home. The rooms are well laid out with equal portions of the screen dedicated to displaying your cards and enjoying a bit of banter with your bingo buddies. There are enough options built in to keep things interesting and plenty of emoticons and acronyms to stop chat becoming boring. One really nice feature, is the ability to send your friends virtual gifts, some of which are free and others that can be purchased using your loyalty points. When it comes to promotions Silk Bingo is left somewhat lacking. If you love big money games you will be more then happy with the number of guaranteed jackpots games offered by the United Bingo network, but if you prefer to win prizes you are probably better off looking elsewhere. On the plus side, there is plenty of free bingo to get your teeth into with jackpots of up to £100 up for grabs, plus a special room exclusively for their VIP players. Silk Bingo bill themselves as “the #1 UK bingo site for online bingo players who love gorgeous jackpots, free bingo play and hot slot games!” but unfortunately we would have to disagree. Don’t get us wrong, Silk Bingo is not a bad site and they do have a lot to offer, but these days there are just so many sites out there, offering so much more that they really do fall short of the mark. The Globalcom/888 software can’t really be faulted but the network seriously needs to look at their promotions if they hope to be competitive in the crowded online bingo market. 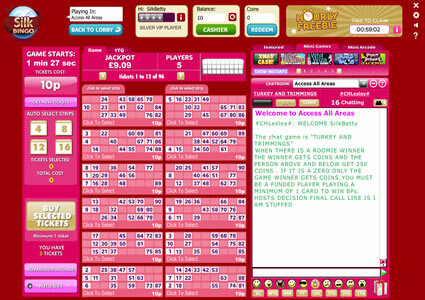 Silk Bingo is home to a wide range of games including both 75 and 90 ball bingo. They also have literally dozens of instant games including progressive slots, casino games, scratch cards, fruit machines, adventure games, arcade games and Keno, so there is sure to be something to take your fancy. All of these games are accessible from the lobby and within the bingo rooms, with them opening up in a small panel above the chat room. Silk Bingo is powered by the Globalcom/888 software, so the odds are everything will feel very familiar. Click on the ‘Options’ tab and you will find a choice of eight different dauber shapes and colours. You can automatically daub your cards, have the best cards sorted and also have any with 3TG or less highlighted. In addition to all of this, there is a handy autobuy feature, so you don’t need to miss out on any games if you have to step away from the computer. 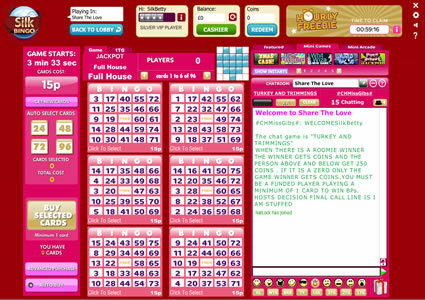 To take advantage of Silk Bingo’s free bingo games, you must be a funded player. Head into the lobby and click on the ‘Free Bingo’ tab and you will a selection of free bingo options. There is the 1st Deposit Freebie, a £50 jackpot game and the Daily Free game that boasts a £500 jackpot. In addition there are no cost rooms accessible dependent on your loyalty level. Please note that the above jackpots may have changed since this review was written. There are also Mega Jackpots, games with prize money in the thousands and these can be found under their own tab from the lobby. When it comes to bingo promotions, Silk Bingo is sadly let down by its network, as there is not a lot going on unless you are looking for guaranteed jackpot games. In addition to the daily specials mentioned above, they host twelve ‘Daily Dozen’ games each day between 11pm and 12pm. 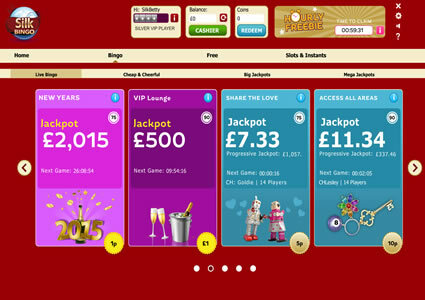 Through these games, Silk Bingo gives away a guaranteed £750 each day; That’s £5,500 each week. Between Thursday and Saturday each week they also host ‘Weekend Wonga’ games. These games take place each evening between 7pm and 8pm in their ‘All Areas’ room, and each one comes complete with a £100 guaranteed jackpot. Apart from these games and the free bingo, the only other promotion offered by Silk Bingo is a refer a friend scheme, which rewards you with £10 worth of bonus money each time you invite someone to register and they make a deposit.